When an app has a problem, is it really worth it to inform Apple? What causes the Java installation dialog to appear in OS X? Almost consistently each time I want to quit Firefox it fails to do so. I have to use the Command-Option-Escape technique to force it to quit. Following this I would be prompted to Inform Apple, which I of course do, but I wonder what good that process really does. Sometimes if I let it “hesitate” for up to a minute it will finally quit. I used to use Firefox, and finally gave up on because it has serious memory leak issues in OS X, even this many years under development. What that means is that after using the browser for minutes to hours, it would eat up system resources, become non-responsive, and often require me to force quit, as you’ve had to do. With one release maybe a year or two ago, I had to force quit every time, though that problem went away. A bloated extension list could cause Firefox instability. Browsers can become unstable due to plug-ins, and you might review the Tools > Add-Ons view to check what Extensions and Plug-Ins you have installed. Remove or disable the ones you’re sure you don’t need, and see if that helps. And make sure all the ones you do are up to date. I switched to Safari just a few weeks ago, after finding it incomplete in previous releases. Some of the new features, including muting individual tabs to stop, ahem, auto-playing videos are worth the switch, but it also doesn’t appear to get crashy over time or bloat itself, even with a similar set of extensions from the same companies installed. As to whether Apple reads crash reports, we have to fire up the old Magic 8 Ball, and the answer is always, “Hazy, try again later.” Apple reveals very little of its internal procedures, but from what I’ve heard from third-party developers, the fruit company seems to recognize when an abundance of problems occur, and will alert developers to help them improve their product. Developers can also include crash reporting in a couple of different ways, and I can tell you that nearly every software firm I’ve talked to takes these reports very seriously in improving products. You can file bug reports for Apple products and OSes directly at its primitive Bug Reporter site, which is so ancient looking you’d believe it’s not used at all. Apple does read and respond to this, but not directly. I recall filing a bug report about a web server issue in OS X Server in the late 2000s, and several months or maybe a year later getting a response that the problem had fixed. Often, you don’t get any update at all. 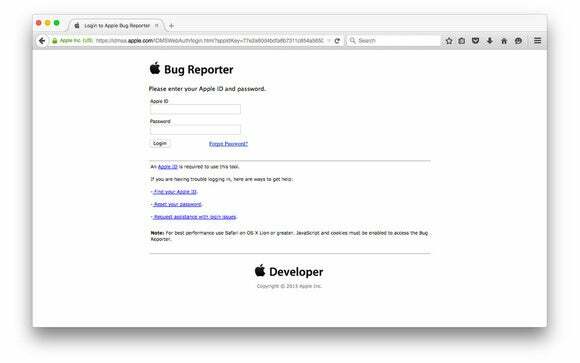 Open Radar is a community bug reporting site that encourages developers posting scenarios to Apple’s tool to also replicate them so that the information can be shared. You can search through here for known bugs that other people have written up.